With our educational offers and materials we expecially want to call attention to the topic of sustainability. No matter if playful or theoretic, our approaches at conveying knowledge are suitable for all ages! We offer seminars, lectures, discussions, meetings, workshops and more. Here you can find a selection of workshops that we offer. We have selected different formats to give you a small overview of our educational work. Depending on the group, the workshops are adjustable on time, topic and skill level. Upon request we are happy to develope a workshop fitting to your wishes and requests. Every year a large amound of damaged bike tires accumulates. A small hole is enough for a lot of people to get rid of them.And yet, tires are a durable and versatile material. They are waterproof, easily malleable, easily cut with regular scissors and still very robust. We want to utilize those traits: because we have a steady suppy of damaged bike tires they are perfect for upcycling projects. 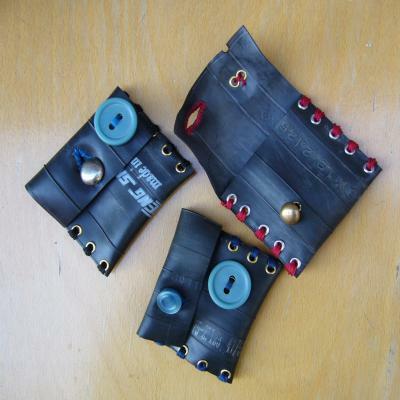 No matter if you want to make a bag, a wallet, jewellery, puppets or knitted pieces – with tires, only your imagination dictates what you can or can’t do. Plastic bacs made out of HDPE/ LDPE (High/ Low density polyethylene) are transformed into waterproof book covers, CD covers or laptop bags. Polyethylene is a thermoplastic that can be easily upcycled, because it forms new bonds under high heat. Sadly, every year tons of this material are thrown into the garbage or into the ocean. Even if we try to avoid it, plastic bags somehow find their way into our kitchens. 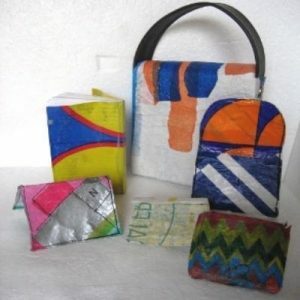 Instead of throwing them away, we want to prolong the life of the plastic bag by upcycling it! 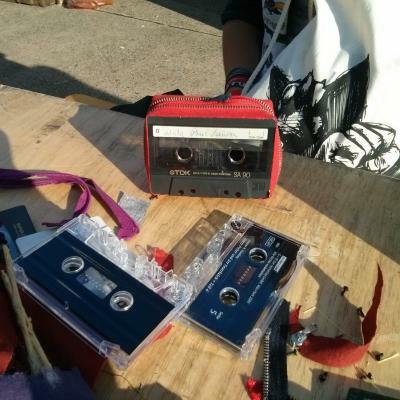 Old music tapes and cassetes are rarely used nowadays. Their technology is out of date, but a lot of people still have them stored away at home. They use up space, and nealy nobody still has a tape player. So what are we supposed to do with all this material that seemingly became obsolete? Easy! We will craft beautiful and funny, retro looking wallets out of the tapes casings.They are easily opened and closed via zipper and can be decorated with stickers, yarn, fabrics and other reused material. We will give new life to old materials! 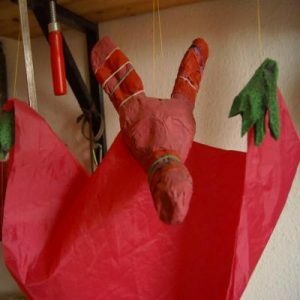 In this workshop, puppets are made out of different recycing materials. Out of socks, rubber foam, newspapers, empty packages and different decorations new funny creatures emerge. Those can interact with each other afterwards in small theater scenes. The workshop takes at least 1,5 hours and can be done with the smallest children. For older children or adults the workshop can be adjusted regarding skill level, time and effort, so everybody can go home with the feeling of having learned something and of having accomplished something. For everyone who always wanted to play the keyboard in a band but just can’t, or for everyone who just simply doesn’t have an instrument: the e-thumb piano gives you the opportunity to jam at maximum volume with a self-made, purse-sized instrument! Outfittet with a sound pick-up, the electric tumb piano can be easily conected to a sound system. If needed an effects unit (i.e. 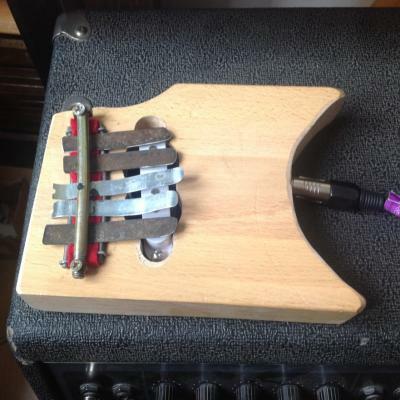 a sound pedal) can be connected too. The workshop takes place in the open wood shop in Pankow at previously statet times and dates. Our Lectures can be hold in german as well as english. If you want us to especially pay attention to a specific topic please don’t hesitate to ask us. Seminars can be hold in german as well as english. We gladly offer our rooms as a place to hold the seminar. Every seminar can be individually designed with you to adapt to your needs and wishes. Our tours can be hold in german as well as english. Und außerhalb… Mit alten sowie neuen Konzepten kommen wir gerne zur euch! Schulen, Jugendclubs, Kulturbetriebe, kommerzielle sowie nicht kommerzielle Einrichtungen, Veranstaltungen, Messen. Fragen Sie gerne nach!